They are chic, they are feminine, they are modern, they are ultra glam, they are seen everywhere on ramps to roads, they the biggest trend of the year 2013 and they are The Plazzo Pants. Palazzo trousers or Palazzo slacks are long women’s trousers cut with a loose, extremely wide leg that flares out from the waist. Before knowing how, when and where to wear them let’s just rewind you a little backward in fashion. Palazzo pants for women first became a popular trend in the late 1960s and early 1970s. The style was reminiscent of the wide-legged cuffed trousers worn by some women fond of avant-garde fashions in the 1930s and 1940s, particularly actresses such as Katharine Hepburn, Greta Garboand, Marlene Dietrich. During the 1960s, some upscale restaurants resisted modern fashion trends by refusing to admit women wearing trousers, which were considered inappropriate by some proprietors. This posed a problem for women who did not want to wear the skirt styles that were then in fashion. Some women opted to circumvent restaurant bans on women in pants by wearing palazzo trousers or culottes as evening wear. But as it has been known that every great style like history repeats itself, the plazzo pants also revived themselves in the year 2013 and became the hot favorite of the ardent fashion followers. The first things to keep in mind while wearing Plazzo Pants is that try to avoid chiffon because it sticks to the skin, instead go for cotton or linen fabric. Still if you want the one in chiffon make sure the lining beneath it is comfortable. Plazzo Pants are so glamorous and feminine that you can wear and flaunt them anywhere you want, even in office just by keeping and following few simple things. While opting for a plazzo for office, keep the pattern simpler, wear a tight and tucked in top. If you will tuck in your top it will give you a taller and slimmer look. Keep the accessories minimal and not to forget to wear wedges. Remember girls, you are going in office; don’t go for the bling look. If you are going to wear them in day time, go for the printed look, floral patterns, geometric and animal prints, they come in all prints; accompany it with vest and a funky neckpiece or add a scarf for the more feminine and chic look. If you are wishing to go in a party at night or something, wear the single hued Palzzo with a bling top and minimal and statement jewelry. Another thing which one should keep in mind while wearing Plazzo Pants is that to keep the makeup very light whether its day or night. And it’s best to wear high heels or wedges with them. So Metroholicas, go and indulge this must have piece in your wardrobe to flaunt it everywhere. If you are feeling dicey about that winters are soon going to knock the door, don’t worry. 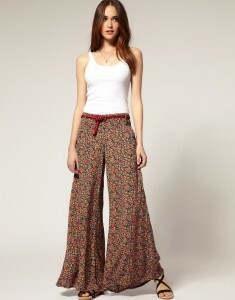 You can wear them in winters too, just wear warm legging underneath you Palazzo pants and Be Fashionable….!! !